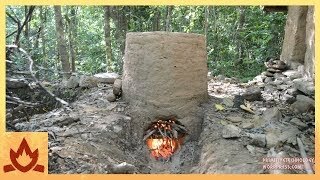 I built this pottery kiln and some pottery from termite mound clay to test an alternative clay source to my usual one from the creek bank. I started by making a large grate from ordinary clay. It was just under 50 cm in diameter. Next, I took dry chunks of termite nest and put them into the pit in front of the tiled roof hut. The chunks were crushed and water was added to slake the clay. The clay was trodden on to mix it. Dead palm fronds were added to the clay to stop it from cracking as it dried and to add insulation to the kiln. The mixture was trodden on again and then taken from the pit. A trench was dug to form the firebox of the kiln and a wall of clay was made in the front of the trench. A hole was dug into the wall to allow air flow into the firebox. Tout semble si clair sans un mot ! Très bien filmé aussi … merci !